We often think of mothering as a kind of “all or nothing” sort of thing. One either is a mother or not, commits to mothering or not, enjoys time with her children or not. But motherhood isn’t really like that. No relationship on the planet is really like that. I think we give ourselves permission to feel complex feelings in most other relationships but have a harder time allowing such a thing for moms. The truth is, we are capable of both desperately needing the touch and voice of our children and also desperately needing to feel only the feel of our own skin on our own bones. I have this lovely teapot that my partner bought me for Valentine’s Day; it serves just one. It came with a matching cup into the top of which the small pot sits. I put a tea bag in the cup and one in the pot to let them steep and then sit for a while by myself and drink them both. 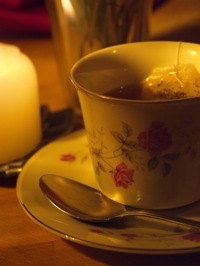 One of my favorite things is to sit alone in the dark with a cup of tea or joe where the only sensory or other stimulation I have is that warm cup in my hand and that soothing drink in my mouth and, ideally, the feel of a cool wind coming through an open window, or of the heat coming from a fire. This time is so important to me that I’m willing to get up nearly every morning, at least half an hour earlier than I have to, just to gift it to myself. I discovered the necessity of this time about seven years ago when I was approaching a breakdown and I’ve been prioritizing it since. With this time, I am able to start my day off more grounded, and now I can’t bear getting up and jumping right into the day. On the few occasions when I have to get up and get rolling right away, I’m pretty rattled. It took me a long time to figure out that this time alone, when I’m not anybody’s anything, was not just lovely and not just helpful, but that it is right and just and absolutely reasonable that I have it. I need it to gather my sense of self for the day. And when I see my children later or even my partner for that matter, I can be grounded with them in ways I’m not capable of when my sense of self is scattered. I do love being the mother of my family. I enjoyed my time this past weekend with them and with my extended family immensely. My partner and children and I got stuck in a traffic jam on the way home from my parents’ house and I was strangely satisfied sitting there, gridlocked. I was so content to be in the company of these people, no matter the context. I felt wholly connected with them and crazy love for them and deeply loved by them that day. And then, because people are many-sided, I loved shopping by myself yesterday, and having coffee and writing this post by myself this morning. The place where I see the most starkly honest representations of emotional complexity in maternal feeling is on Twitter. I’ve seen numerous mothers tweet about looking forward to some time alone, to some time to think, when the children go to grandparents’ houses or go off with someone else for a long day. And then these same moms tweet, once everyone has left and the house is empty save for them, that they are rather frozen. And then they’re annoyed with themselves for being frozen this way. I’ve done that. I do that. Usually what I do is develop this absurdly long list of all the things I’m going to accomplish when I have some time alone, and then end up doing pretty much none of it, probably because what I need more than time to accomplish tasks is time to shut off, time to not be anybody’s anything. I must confess that as I write I wonder what my children will think when they read this, and whether they will know that I can love to mother them and also love times when I’m not called upon to. Maybe they won’t understand until later. But I hope that they can see, even now, that this is not different from the things they feel about people, including what they feel about me, and that this is right and just and absolutely reasonable for both of us.